This month marks 28 years since the launch of the Hubble Space Telescope (HST), arguably the largest and most significant advancement in the history of optical astronomy since Galileo’s first use of a telescope, around 400 years prior. Before Galileo, all that had been known about the cosmos came from observations carried out with just the naked eye. With the dawn of optical telescopes, a previously unobserved universe was unveiled. The Milky Way, with its cloudy appearance, was actually sprinkled with billions of stars. The moons of Jupiter, the rings of Saturn, the phases of Venus and many other observations taught us much that was before impossible. The HST was revolutionary in its groundbreaking possibilities. All telescopes prior to Hubble had one common shortcoming; Earth’s atmosphere. Even the largest telescopes, placed on the darkest mountaintop, could not match what a space telescope like Hubble could offer. One of the major results that the HST mission provided was the possibility to calculate the age of the universe to a greater accuracy than ever before. Through the observation of Cepheid variable stars with a higher accuracy, the Hubble constant value, which specifies the rate of expansion of the universe, could be better constrained. The age of the universe was thus more accurately calculated to 13.7 billion years. In addition, through the observation of Type 1a supernovae with Hubble and other ground telescopes, the expansion of the universe was not only further confirmed, but also found to be accelerating rather than slowing down as would be expected under the expected effects of gravity. The discovery of this accelerating expansion led to theories about the possibility of dark energy, permeating all space and opposing gravitational effects effectively on a galactic scale. The HST is also responsible for the observation of the oldest and farthest galaxy ever imaged, at a distance of 13.4 billion light years from Earth. However, this approaches Hubble’s limit of possible observations into the distant past of the cosmos. Light is redshifted, through the expansion of the universe itself, meaning that light from farther and farther objects tends to become redder and redder as it approaches us. Until it approaches us, light from the earliest stars forming in our cosmos would be redshifted to the infrared portion of theelectromagnetic spectrum, and thus a telescope more sensitive than the HST in the infrared domain is necessary for such observations. Enter JWST. The James Webb Space Telescope, currently in final testing phase, was specifically designed to observe in the infrared range. With launch dates being unfortunately delayed time and time again, latest estimates are that JWST will not launch until at least 2020. When it does, however, JWST will boast a 6.5m diameter mirror, composed of 18 hexagonal mirror segments – for comparison, Hubble has a 2.4m mirror. Thanks to its intended observation frequency range, JWST will be able to detect the ages of first light – when the first luminous objects in the universe shone for the first time. It is intended to be able to observe the very first galaxies, and thus study their formation. Particularly, it will allow astronomers to answer some of the questions regarding the first steps in the evolution of the universe from a cloud of hydrogen and helium to the universe we see every time we set our gaze – or our telescopes’ sights – on the night sky. Josef Borg is currently a PhD student within the Institute of Space Sciences and Astronomy, University of Malta, and also the president of the Astronomical Society of Malta. • Hubble telescope discovers a light-bending ‘Einstein-ring’ in space. The perfect circle surrounding a galaxy cluster in a new Hubble Space Telescope image is a visual indicator of the huge masses that are bending time and space in that region. The galaxy cluster, called SDSS J0146-0929, features hundreds of individual galaxies all bound together by gravity. There’s so much mass in this region that the cluster is distorting light from objects behind it. This phenomenon is called an Einstein ring. • NASA begins building new Mars Rover for 2020 launch. NASA technicians have officially begun the assembly, test and launch operations (ATLO) phase of development on the agency’s next Mars rover, keeping the project on track for an expected 2020 launch. The Mars 2020 rover is coming together at the Spacecraft Assembly Facility High Bay 1 at NASA’s Jet Propulsion Laboratory (JPL) in Pasadena, California. There, technicians are working on the rover’s descent stage, “a rocket-powered ‘sky crane’ that will lower the rover to the planet’s surface,” according to a March statement from NASA. • The Hubble Space Telescope orbits Earth at around 28,000km/h. Notwithstanding its velocity, at an altitude of around 547km in low Earth orbit, Hubble has extreme pointing accuracy and steadiness. Hubble is able to keep track of a target without deviating more than 0.007 arcseconds, equivalent to the width of a human hair as seen for a distance of 1 mile. • Just after launch and start of operations, the Hubble Space Telescope was determined to have a major flaw. 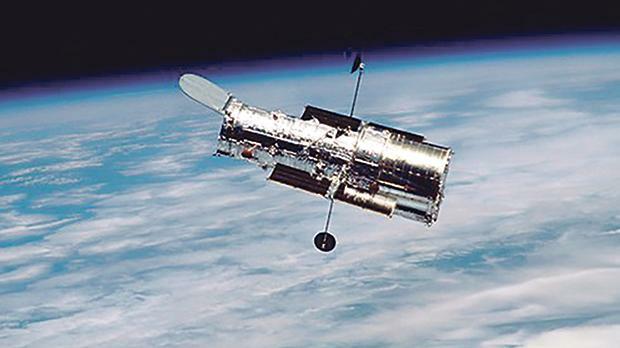 A mishap with Hubble’s main mirror, only discovered after launch, compromised Hubble’s capabilities to such an extent that a servicing mission was carried out. To this day, Hubble remains the only space telescope to ever be serviced by astronauts while in orbit. However, the servicing mission was a huge success, and the billion-dollar telescope was now fully operational to its maximum potential. • Hubble could remain operational till around 2030-2040. Notwithstanding the construction and eventual launch of its successor, the James Webb Space Telescope, Hubble could remain in orbit and functional even after its successor’s probable lifetime of around five to 10 years. Hubble could even be cleared for a further servicing mission to increase its lifetime further.